A number of deadly attacks throughout Pakistan have killed and injured dozens in the past week in what the United Nations has condemned as “cruel acts of violence”. 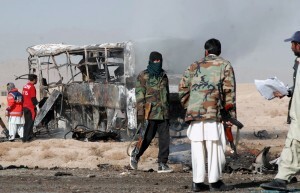 At least 19 people were killed and 25 injured when a convoy of three buses carrying Shia pilgrims on their way to Iran was attacked by what appeared to be a suicide bomber in Baluchistan’s Mastung district, southwest Pakistan. Police officials there have said the death toll is likely to rise. The attack comes as Pakistan experiences a wave of violence by Sunni extremist groups targeting the minority Shia community, who make up 15 percent of the population of 190 million. Authorities in the capital Islamabad also reported to have discovered the remains of 21 members of a tribal police force believed executed by the Taliban in the northwest region of the country. Meanwhile, security forces also reported finding the bodies of nine “militants” dumped in the North Waziristan tribal region. In a statement released to the media late Sunday, UN Secretary-General Ban Ki-moon condemned the “escalating terrorist violence” in Pakistan. Ki-moon spoke against “the continued violent targeting of religious minorities” – as well the killing of 21 members of a government-backed tribal police force last week, a UN spokesperson said. “These cruel acts of violence cannot be justified by any cause or grievance. Their perpetrators should be brought to justice,” the spokesperson added.